Today I'm going to show to the cover for the version of my book which is being published in the USA by North Light Books on 1 January 2015 with this title Drawing 365: Tips and Techniques to Build Your Confidence and Skills . First of all - very many thanks to everybody for getting my version of a launch for my new book off to a good start. At the time of writing it's now up to 130 likes on my new Facebook Page in c. 18 hours - which is absolutely fabulous! 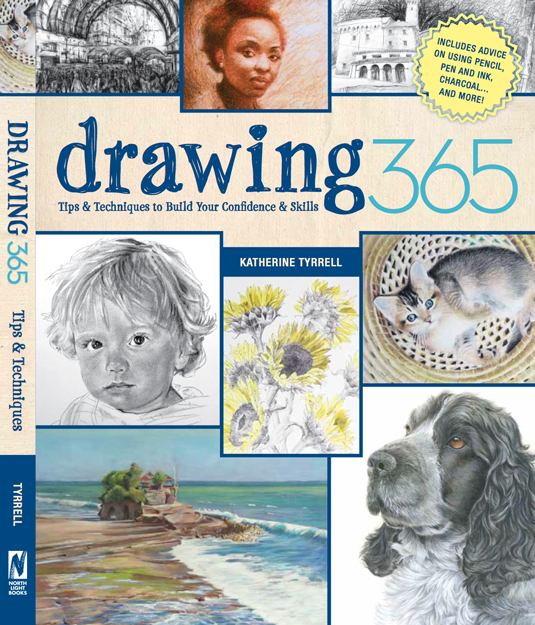 Check out the new page here - Katherine Tyrrell: 365 Tips for Drawing and Sketching. Below you can find the front and back cover of the American edition of the book PLUS the Contents Page! Here's the front cover of the book in the USA. As you can there are images by lots of different artists on the front page - of which three are mine. Pick of the Litter (coloured pencil) by Katherine Tyrrell - a crop of this drawing also sneaks in at the top of the spine - see top left of the above image! Audrey 2 (coloured pencil) by John Smolko. This image also gets a full page treatment so all those who wondered what John's work looks like close up can have a jolly good look! I saw his work up close in a CPSA exhibition in Albuquerque and knew it was inspirational up front! I liked their description of the book - which I didn't get to write! Make drawing a part of your daily life, while turning every day into inspiration for your art. Designed to fit your life, Drawing 365 presents a comprehensive art course in bite-sized chunks—so it’s easy to dip in, even for just five minutes at a time. open it daily to find a new tip, idea, technique or challenge ... all aimed at getting you into the habit and mindset of an artist. You’ll find expert insights on everything from value, perspective and composition, to how to use a shadow box, compose a self- portrait in the form of a still life, and work from life. Subjects : still life, people, animals, landscapes, interiors, flowers, water, skies ... the possibilities are all around you! 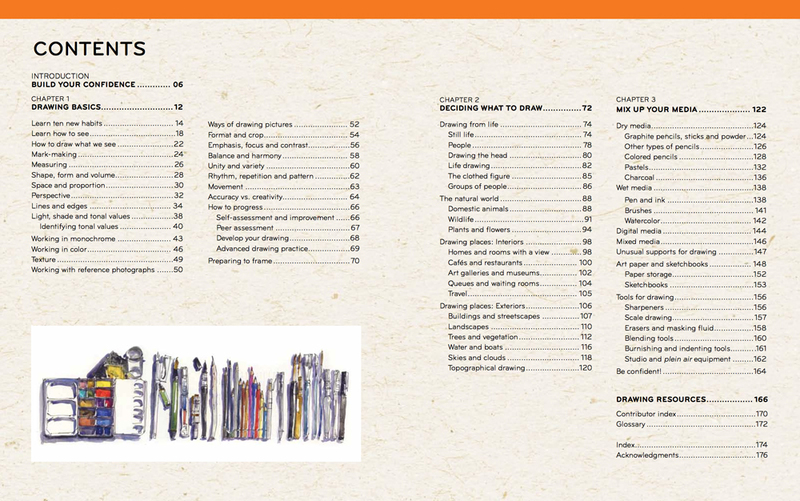 This is the Contents Page - which helps people understand more about what the book is about. I was absolutely determined to keep the media to the end on the principle that you can draw with all sorts of different media - as the images in the book demonstrate. The aim was to wet the appetite to find out more about different types of media as people go through the book! As you can see, the book is priced at $24.99 - but it is already listed on Amazon for PRE-ORDERS and where you can also see a "look inside" version. More about what I was trying to do when writing the book in the third post - which will highlight the cover of the Asian (English edition). A great book , one to read cover to cover and then dip into. Great work in it. So happy to be in it too. Can't wait to see the real thing. I should maybe add that Vivien (who's a very experienced art teacher) was one of my "readers" as I was writing my book. You always need to have a pal alongside who'll tell you what's not working! I posted a link to this blogpost on my own blog and on my Facebook page so hopefully that will get a little extra traffic coming this way. Congratulations on seeing this through to the successful publication. Its been a huge project Im sure. Can't wait to get my own copy! Very cool Katherine. I'm sure you have some satisfaction from seeing it all come to fruition. I will be checking it out. 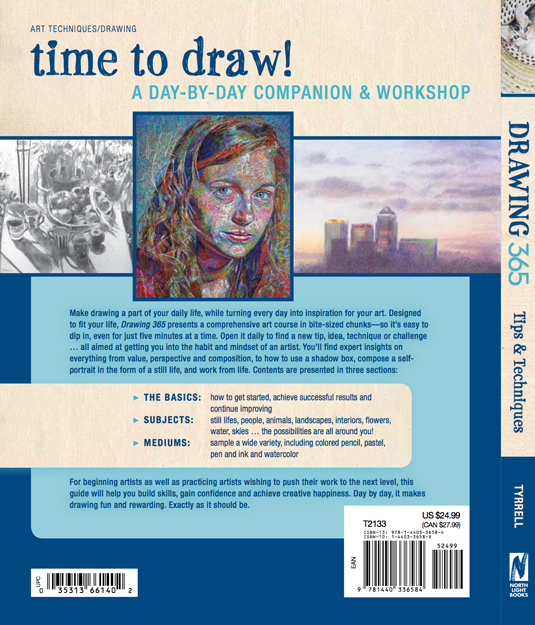 I love that it will be published on January 1 and is titled 365 Tips for drawing and Sketching. Perfect way to begin the new year! It's not actually called 365 Tips for Drawing and Sketching although that in fact was its working title while I was writing it. Tips and Techniques to Build Your Confidence and Skill"
Congratulations, Katherine, and thank you so much for including me in your book! I made a post on my Facebook page last week and just now a post on my blog. I'm sure your book will be very successful! Excited to get my complimentary copy at the studio today! I have a copy that I rushed out and bought when it was first released for my classroom at The American Academy of Art, and now I have a copy that I shall keep pristine for my own library. Thanks again Katherine for including me in the book. Its a super reference book, helpful, clear and beautiful to look at. I'm so glad the complementary copies for the artist contributors have finally started to arrive! I too bought one for practical use so I could keep the other in pristine condition!